Optical measurement of solid samples, powder samples or highly concentrated solutions can be achieved. The accessory is designed to prevent the spectra reflection from the sample surface from entering the emission monochromator. The figure shows results of a 3-D measurement on a plasma display panel. 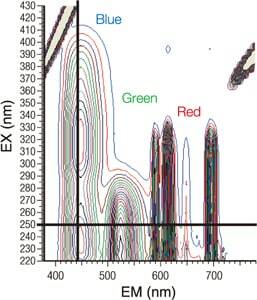 On each excitation wavelength, blue, green, and red spectra are observed. 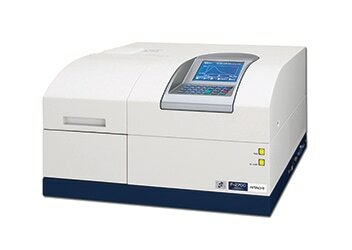 The F-7000 series featuring a high scanning speed can obtain the data shown on the right in as little as 1.5 minutes. 3-D assay presents a great deal of information from a single sample preparation process, thus reducing the amount of time required to run measurements. The ultra-high speed scanning of the F-7000 series can be a powerful tool for the measurement of samples that change with time.